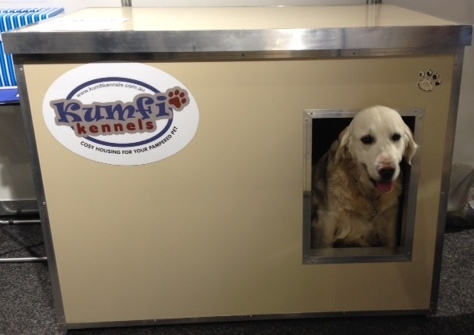 Kumfi Kennel’s Insulated Patio Kennel is the only dog house you will ever need. This kennel is not just for your patio. 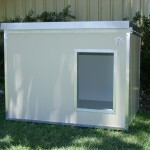 It is also suitable for your backyard, a shaded spot along your fence line or in your beloved pet’s enclosure. The Patio Style Insulated dog house is designed to provide maximum protection from the elements whilst giving your pampered pet a comfortable environment to relax in. 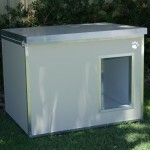 All Patio Style Insulated dog houses have a lockable hinged roof. This Insulated roof slopes slightly to the rear of the kennel for rain or moisture to drain. The roof opens from front to back for ease of cleaning and routine maintenance. This also aids in training your pet to use the kennel. With a raised Insulated Panel floor aids in creating a damp free environment. The doorway is centered on the front wall, an eave has been built into the roof for added protection. 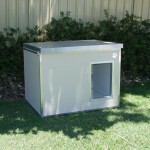 The Patio Style Insulated dog house is the ideal dog house for your pampered pet. Made from quality Colorbond steel encasing a block of EPS foam resulting in a tough and durable product. Your pet won’t chew this kennel. 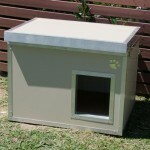 The EPS-FR insulated panel design ensures the maximum comfort and protection for your beloved pet. The insulated panels have an anti-bacterial coating (Colorbond Permagard). This makes it virtually impossible for bacteria to grow as long as a maintenance schedule is maintained. The external face comes in one of four standard colours. 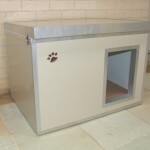 Accessories are available to personalise and add additional comfort to each kennel such as: dog doors, solar fans, cool mats, caster wheels, adjustable feet, doorway awning, plywood floor & name plaques. Select one of the pictures below of the preferred size for more specific information. You will be able to select the colour and obtain a formal quote.